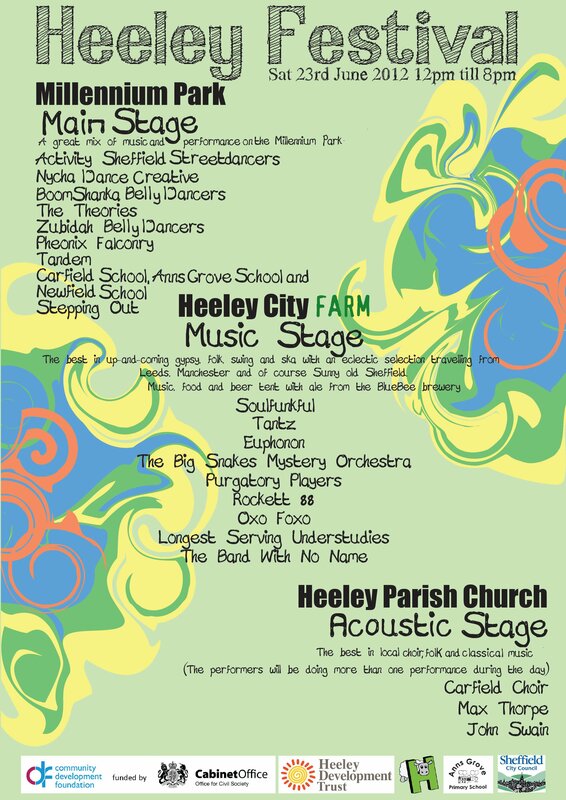 Heeley Festival 23rd June 2012 | IT'S HAPPENING IN HEELEY! 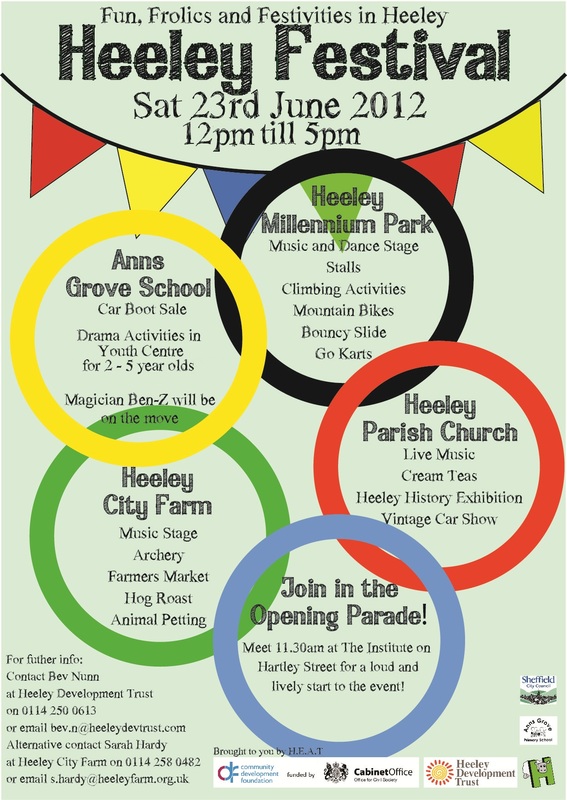 It’s that time of year again… the countdown to the fabulous Heeley Festival! This year’s event will be on Saturday 23rd June and, as usual, promises something for everyone. Meet us at 11.30am at The Institute on Gleadless Road to join a noisy and colourful opening procession as it winds its way through the park to kick off proceedings at 12 noon. Everyone can join in, and to celebrate this year’s Olympics theme, why not come along in fancy dress with a flag to wave. Taggy’s Field will play host to the main music and performance stage, delicious food from around the world, and a vast array of community and craft stalls. In a jam-packed stage line-up, this year showcases exciting new talent from Newfield School – young indie rockers, Tandem, and returning band, The Theories. There’ll be several local dance troupes, as well as flying demonstrations by Phoenix Falconry’s birds of prey. Over at Heeley City Farm, you can browse the Farmers’ Market, coo over the baby animals including pygmy goats, soay lambs and piglets, and enjoy wholesome homemade food from the Farm Kitchen. There’ll be live punk and ‘world’ music too. Heeley Parish Church invite you to indulge in a decadent cream tea while enjoying acoustic performances from Carfield Community Choir; classical singer, Max Thorpe; and local musician, John Swain. Alternatively, peruse Heeley History Group’s fascinating exhibition of our local past. New to this year’s Festival will be a Vintage Car Display on Gleadless Road. So if old motors make you rev with pleasure, then this is for you. Bargain hunters will be pleased to know that the ever popular Car Boot Sale at Anns Grove School will be back! Head on down to the car park to dig around for trinkets and treasures. It’s unlikely you’ll leave empty handed. The kids certainly won’t be bored with a bouncy slide and castle, Go-Karts, archery, rodeo, face painting and Pyjama Drama to keep them entertained. Magician, Ben Z, will be travelling across the site conjuring magic and mayhem. Adrenaline junkies can get their sweat on with Recycle Bikes on the fantastic new mountain bike track, or get climbing on the boulder. This is the biggest date in the Heeley calendar so make sure you don’t miss it. We’ll look forward to seeing you there and fingers crossed for sunshine! Heeley Festival is organised by HEAT, a partnership between Heeley Development Trust, Heeley City Farm, Heeley Parish Church and Anns Grove Primary School. This year’s event is funded through a Community First grant and a donation from Tillotson TARA (who deserve a big THANK YOU).